SEBASTIAN – The National Hurricane Center is monitoring Tropical Storm Two, which formed Thursday morning in the Atlantic Ocean. There is no indication the depression will form into a hurricane, much less strike Florida or Indian River County, according to forecasters. 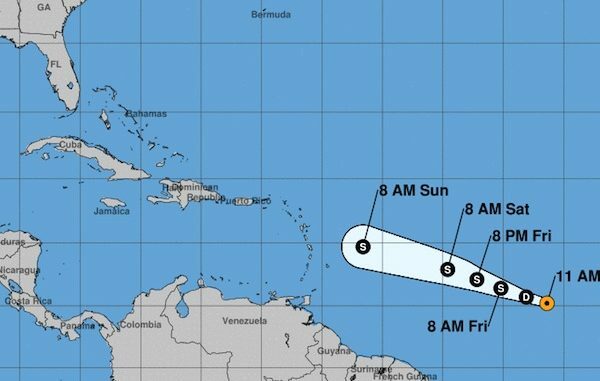 “The system is expected to begin encountering strong westerly shear and also accelerate, both of which should cause it to degenerate into an open wave east of the Lesser Antilles,” a spokesman for the National Hurricane Center told Sebastian Daily. A tropical depression is a low-pressure system with thunderstorms that produce maximum winds of about 39 miles per hour. Anything more than that is considered a tropical storm. As of Thursday morning, the storm system was located between the Cabo Verde Islands and the Lesser Antilles, southeast of the Caribbean Sea. “At 11:00 a.m., the center of Tropical Depression Two was located near latitude 10.2 North, longitude 41.4 West. The depression is moving toward the west near 16 mph. A fast westward to west northwestward motion is expected through the weekend,” the National Hurricane Center said. The system is expected to deteriorate before moving closer to Peurto Rico in the coming days.